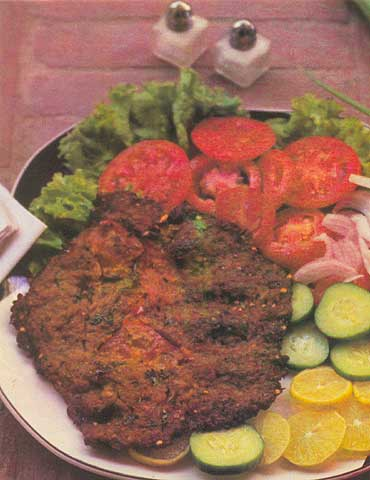 A famous and traditional recipe of peshawer. Chop tomatoes,green chillies,onions and mint leaves. whisk the eggs and fry them like omlette. Cut the omlette into small pieces. Crush whole coriander seeds,white cumin seeds and whole black pepper. Mix Mix mince and the remaining ingredients.Set aside for 15 minutes. Soak your hands in water and make small or big chapli kababs. (kabab should be flat). Heat oil in a frying pan and fry the kababs. Serve with naan or kulchay and any sauce.